The report that sunk St. Jude Medical's stock prices contained a letter from Dr. Nayak. It was later edited to add a note saying that the letter did not reflect the opinion of his employer. Health-care security company MedSec, investment research firm Muddy Waters Research, and University of Chicago medical professor Hemal Nayak filed a response on October 24 to St. Jude Medical’s lawsuit against them. St. Jude’s lawsuit was filed on September 7, two weeks after the defendants published a report alleging security risks in pacemakers, implanted defibrillators, and other cardiac rhythm management (CRM) devices designed by St. Jude. The lawsuit stated that MedSec, Muddy Waters, and Nayak fabricated these claims for their own financial gain, citing the fact that Nayak sits on MedSec’s board of directors as evidence of a conflict of interest in the defendants’ research partnership. Nayak wrote a letter on University letterhead that accompanied the report. The report was later edited to indicate that the letter does not "relate to nor reflect the views of the University of Chicago or the University of Chicago Medicine." Muddy Waters’s business model involves investigating companies and then making investment decisions based on their discoveries. This can include short selling, or betting that the company’s value will decrease, after the publication of negative findings. Muddy Waters announced that it was shorting St. Jude when it released its report in August. 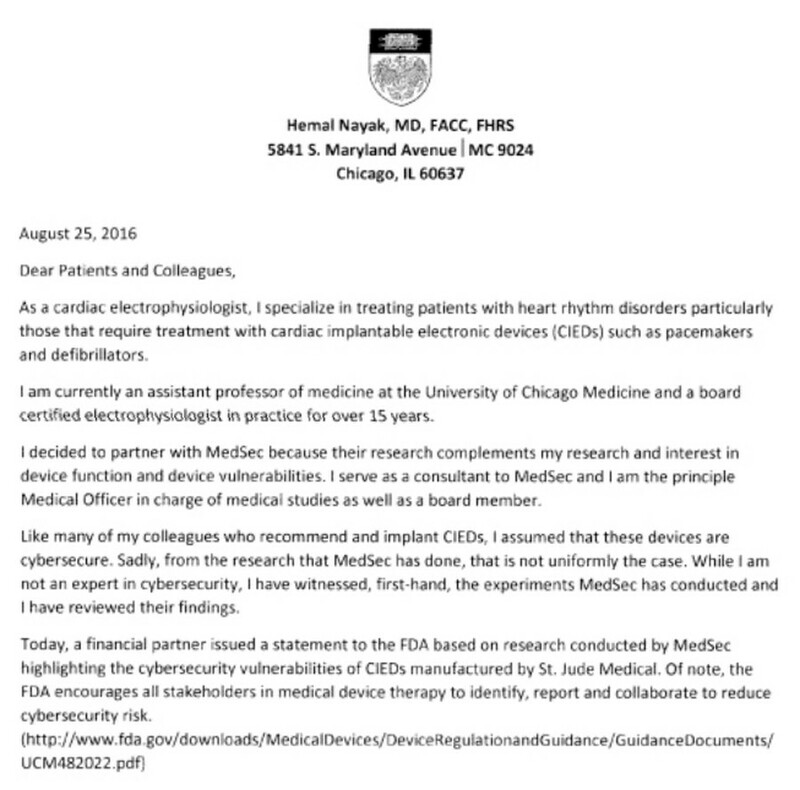 “In particular, the wireless protocol used for communication amongst St. Jude Medical cardiac devices has serious security vulnerabilities that make it possible to convert Merlin@home devices into weapons,” Livitt wrote. Merlin@home devices are implanted transmitters used to monitor other cardiac devices. According to the testimonial, it is possible to remotely disable Merlin@home devices and deliver shocks to patients from distances greater than 10 feet. Lawyers representing the plaintiff did not respond to requests for comment, and Nayak declined to comment. Defendants and plaintiffs recently jointly asked the judge to delay a pre-trial conference in the case till late January. He is being accused of shortselling a company and then suggesting itspacemakers and defibilitars could be hacked and deactivated.